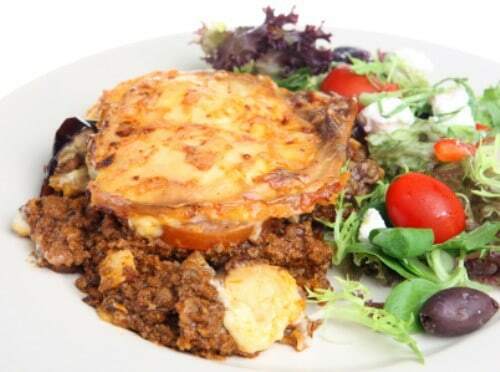 Moussaka - can be made at home with our delicious recipe. Home » Main Dish Recipes » Moussaka don’t miss out on this Greek classic, if you have never tried this before, think of a lasnaga that is made out of eggplant. Moussaka don’t miss out on this Greek classic, if you have never tried this before, think of a lasnaga that is made out of eggplant. This makes a great appetizer or an excellent side dish. You can cook Greek food at home, this is a dish you will find in any Greek restaurant. Don't miss out on this Greek classic, if you have never tried this before, think of a lasagna that is made out of eggplant. Preheat the oven to 475 degrees F. Brush the eggplant slices on both sides with the oil and lay on 2 small or 1 large foil-lined baking sheet. Season with salt and pepper. Cover with foil and bake until the eggplant is soft about 25 minutes. Set aside covered. Heat the olive oil in a large skillet over medium-high heat. Add the onion and cook, stirring with a wooden spoon, until lightly browned, about 4 minutes. Add the garlic and cook, stirring frequently, until fragrant, about 1 minute. Add the beef, oregano, allspice, cloves, and cinnamon. Break the meat up into small pieces and season with the 1/2 teaspoon salt and pepper to taste. Cook, stirring occasionally, for about 2 minutes. Lower the heat to medium and cook, stirring, until just cooked but still slightly pink inside, about 1 minute more. Add the tomato and bay leaf and bring to a simmer. Cover, and cook until the sauce is thickened and fragrant about 20 minutes. Make the custard sauce. Melt the butter in a medium saucepan over medium heat. Whisk in the flour until smooth. Cook, stirring, for 1 minute. Remove the pan from the heat and add the milk, salt, and nutmeg. Return to the heat and while whisking constantly, bring to a boil. Simmer 2 minutes. Transfer the sauce to a bowl and stir to cool. When the sauce is cool, whisk in the egg and yolks. Assemble the moussaka. Lower the oven to 350 degrees F. Brush a 9 x 13 x 2-inch casserole dish with the oil. Scatter the breadcrumbs over the bottom of the pan. Lay half of the eggplant in the pan, overlapping the slices if needed. Cover with half of the meat sauce and smooth with a rubber spatula. Repeat with the remaining eggplant and meat sauce. Pour the custard sauce over the layered mixture and smooth with a rubber spatula. Sprinkle with the Pecorino Romano and bake, uncovered, until lightly browned and the custard is set, about 1 hour. Remove the moussaka from the oven and let rest for 10 minutes. Use a slotted spoon or spatula to serve.